I made three pickguards for my Squier '51s. But they don't have a neck pickup holes. I don't have neck pickups on my Squire 51s. Why? Because the Squire 51 is nearly a perfect guitar. For one thing it has a Strat body. No hard angles poking me in the ribs or cutting off the circulation in my strumming arm. Secondly it has a Telecaster neck, very similar to the Yamaha SE603MA that I learned to play electric on. But unlike the Yamaha it has a hard tail bridge. None of that tremolo nonsense to deal with. And with one very simple, but very important modification the Squire 51 can lose its neck pick up. This allows me to finger pick it like an acoustic, no pickup to catch my fingers. 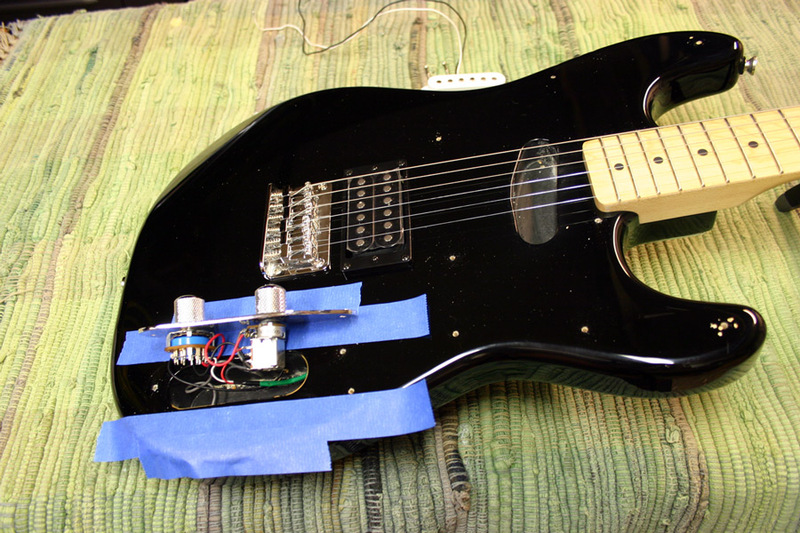 And oh yeah, having a humbucker in the bridge is the icing on the cake. But this modification is not an easy task if you decide to roll your own. 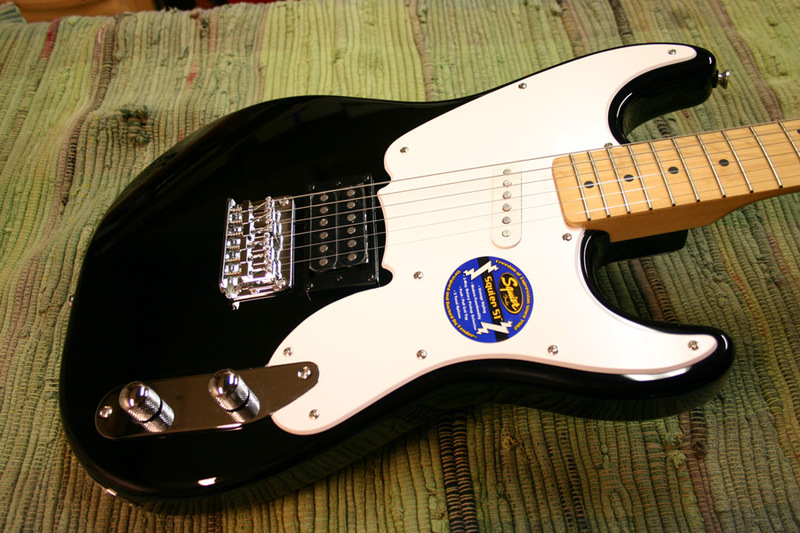 I first had to figure out how route a pickguard, and then do it. But like I said no neck pickup hole. I will document the cutting of the hole with text, but no photos. With that said, you can probably figure it out even without directions. But seriously, you really should just pay someone else make your custom Squier '51 pickguard. Some company on the web or something. They would probably do a better job. My way is overly verbose and complicated. So don't make your own pickguard. You could hurt yourself. Your could hurt your spouse. You could hurt your neighbor's dog. 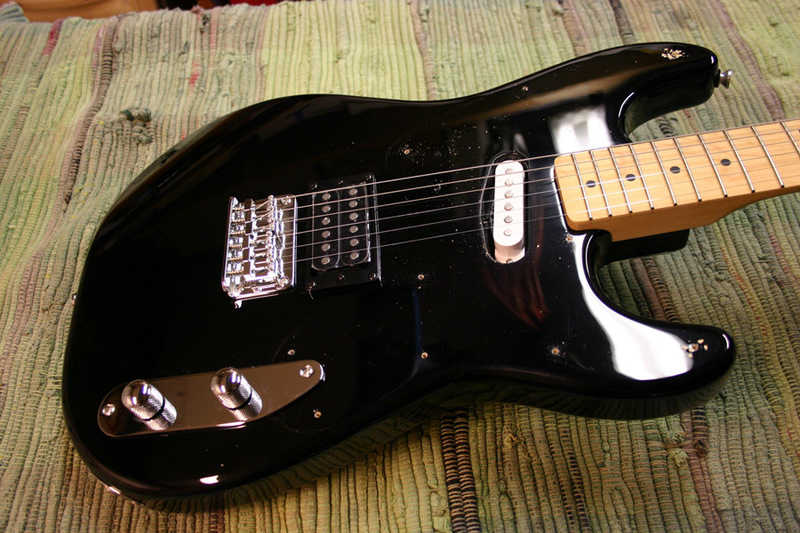 Spacklehoss.com is not responsible for any damage to your precious $100 Squier '51, yourself, your pet Cockatiel or your aunt Betty's floral arrangement. Spacklehoss.com is just not responsible for any, single thing that you do. Proceed at your own risk! There may be a thousand better ways to do this, but this is how I did it with the materials and tools I had. It is obviously a starting point. And this is absolutely not the way professionals do it. Nor is it trying to be. They have more money and better tools. I am just attempting to get near-professional results by non-professional means. The tools used can be found in most high school woodworking shops or a similarly equipped garage. I tried my best to correct the colors of the photos, sorry if the color is a bit off. Shop lights are murder to shoot under. All images and text Copyright Protected © spacklehoss.com 2007. All rights reserved. These are optional but, completely hand sanding the template would be a drag. It would probably be a good idea to read this entire article before starting anything. Click the images for larger ones. 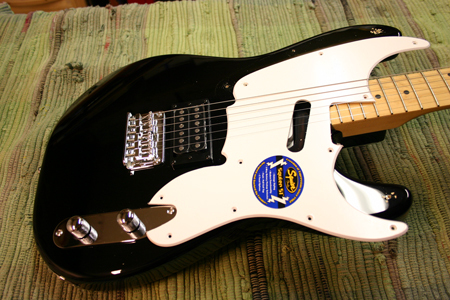 First Thing - You need to remove the stock pickguard. And optionally the neck pick up. So, first remove your stock pickgaurd from the best $100 guitar money can buy and put the screws in a cup or bag or something so you don't lose them. If you are careful, you can do this without removing the strings but it would not hurt to loosen them. Use the right sized screwdriver and be gentle and slow. Next, I removed the neck pick up. You can skip to the next section if you are going to leave yours in. There are two long screws holding in your neck pickup. Take out the screws and put them in the cup with the others. Before you open the control cavity, I recommend you place two strips of that cool 3M removable masking tape on both sides of your cavity. This will prevent you from scratching the finish around the cavity. You need to cut the wires from the neck pick up. 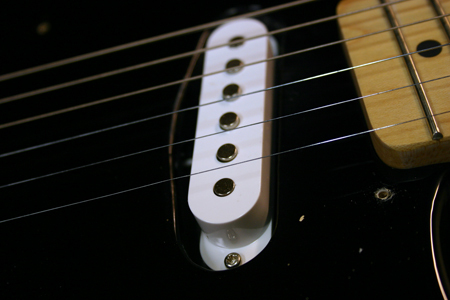 They are a white and black set of wires that come into the control cavity along with bridge pickup wires. The bridge set is easy to identify because it is wrapped in a green sleeve. Carefully follow the wires to their terminals and make the cut. 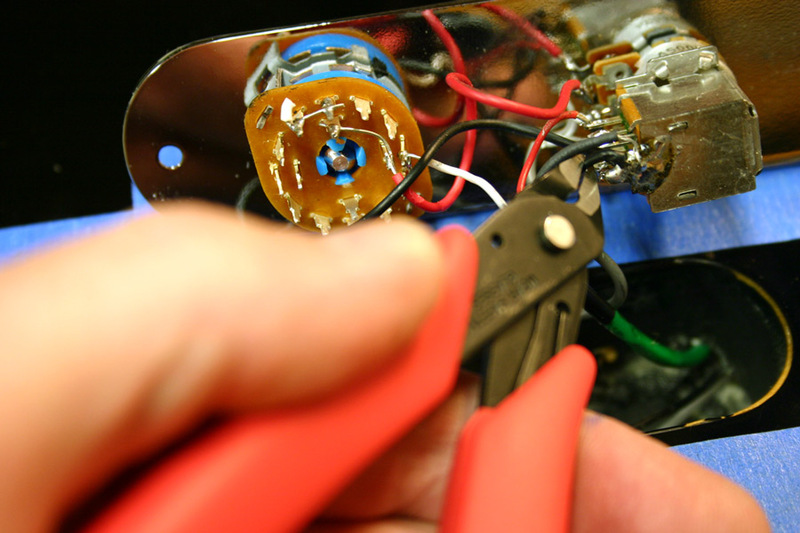 BE CAREFUL and make sure you are cutting the right wires. 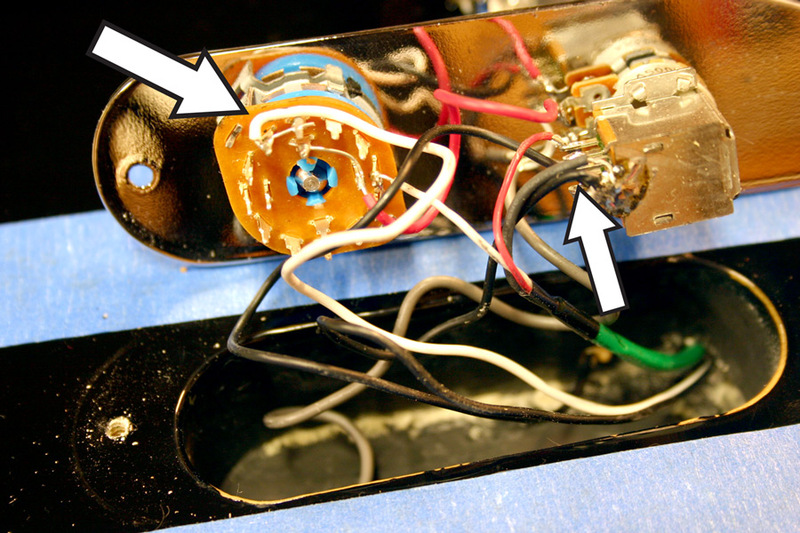 It is easy to mistake your bridge grounding wire for the black neck pick up wire. I leave a little bit of wire and insulation at the solder joint so I can remember where I cut the wires from for future reference. I loosened the strings and pulled them to the side. Next, I gently lifted the pick up out of its cavity, pulling the wires gently out along with the pickup.